Finding a lawyer can be incredibly stressful, especially if you’ve just been terminated from your job or are being harassed or retaliated against. With your financial security at stake, this may be one of the biggest decisions of your life. There are a sea of lawyers out there. How do you pick the right one? Here, I address that question. I offer ideas on how to research a lawyer and questions to ask when you are interviewing one. This is a great start, because hopefully someone you trust has a personal recommendation for a good attorney. Even if the person to whom they direct you doesn’t practice employment law, the legal community is fairly small even in a big city like Los Angeles, and that person can probably give you some names of employment lawyers they know. But, even if someone you know has vouched for a particular lawyer, you should independently verify that the lawyer is right for your needs. For example, someone who did a brilliant job for a friend on an unpaid overtime case might not be the best fit for your wrongful termination case. If you’re reading this page, you are probably among the third of people who start their search by using Google, Bing, Yahoo or some other internet source. (I’m glad you found this–I hope it helps!) 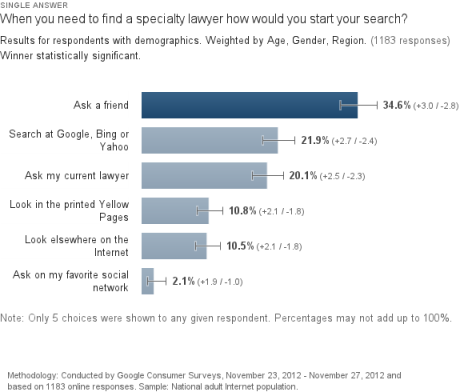 Often, the top search engine hits will be lawyer referral or review sites. Attorney reviews are certainly useful, but review sites can only take you so far. (I have a 10.0 rating on Avvo, so I can say that!) Why? Maybe the lawyer got high ratings representing people in business disputes and you have a pregnancy discrimination case. Or maybe they do mostly defense work, but you are a plaintiff. You must do your research and ask the right questions to find out whether a particular lawyer is the one for you. II. You Have the Name of One or More Employment attorneys — Now What? Hands down, the best place to start researching a lawyer is the State Bar of California’s website. There, you can look up attorneys by name and see their credentials and history. Actions affecting eligibility to practice law (such as discipline). As a fun example, take a look at Governor Brown’s State Bar profile! Go to the lawyer’s website. Read her bio. Find out what she’s done. See if there are certain types of cases she handles. Look at her bar associations and memberships. Look at her speaking engagements and publications. See if you can get a sense of what she’s like. When you speak with the attorney, below are some questions you can ask. You may be able to find out some of these answers via the lawyer’s website. While newer lawyers can do a wonderful job representing their clients, experience is certainly a check in the “plus” column. How much experience do you have in employment law? Have you handled many cases involving the specific claims I have? How many went to trial? These questions are critical. Sometimes I get calls for help on cases that have nothing to do with employment or civil rights law. I let them know that I can’t help them with the explanation, “Would you go to a dermatologist for help with a back injury?” In the same way, most attorneys focus on certain practice areas, and you want to be sure that the one you are going to spend a significant amount of their time handling claims like your own. In smaller towns, lawyers by necessity handle all types of cases, but in big cities like Los Angeles we have the ability to concentrate on the areas of law that we are most passionate about. In fact, many of us employment lawyers narrow our practice even further. For example, I only occasionally do wage and hour cases, as I choose to focus most of my time on representing individuals who have been discriminated against, harassed, or wrongfully terminated. Do you take cases to trial? If not, who will try my case if it does not settle? You want to know what will happen to your case if it does not settle before trial. Who will be working on my case? What will other people do? Who will be the primary point of contact? Who will prepare me for depositions, trials, and so on? Some lawyers work with other attorneys, paralegals, and staff. Find out how and how much a lawyer delegates and ask about those people, their credentials, and their experience. How and when will I get updates about my case? Find out how you will be kept updated about your case. Ask if you will get copies of letters or case documents. How can I reach you? How quickly do you respond to calls/messages when you are not in trial or away? Find out whether the attorney favors emails, calls, or some other communication method. Find out whether you will speak with the lawyer or someone else from his office. A good lawyer can tell you what they like about your case, what the anticipated defenses are, and where potential weak spots may be. Of course, their assessment is only as good as the information you share with them. Also, until they hear from the other side, it is hard to give a complete assessment of your case. What are the different approaches we can take in seeking resolution? Which approach do you favor and why? You want a lawyer who can step you through your options and explain the pros and cons of each. Lawyers in different practice areas charge differently. For example, trusts and estate lawyers may charge you a flat fee to draft your will or trust. Business litigation or defense lawyers usually charge you by the hour. Personal injury lawyers may charge a contingency rate that is fairly low, maybe 1/3 of recovery. Some fees are set by law, such as in medical malpractice cases. How will you handle costs? What costs can be expected in my case? Can you give me an estimate of costs through trial? Generally, you are responsible for your costs in a case. Costs are those expenses paid out-of-pocket to litigate the case, such as court filing fees, court reporter fees, expert fees, photocopying costs, etc. Some lawyers will advance your costs during the litigation. Others will ask you to stay current on your costs and pay them as they build up. Yet others will ask you to pay some portion as you can afford it. None of these approaches is right or wrong, and I know of excellent lawyers who take each of these approaches to costs. It is helpful to have an idea of what costs may arise in your case at the outset. Don’t take for granted that they do. What is your litigation philosophy? Why did you choose to practice law? These types of questions give you a glimpse into the lawyer’s thought processes and general approach to law practice. If what they say resonates with you, that’s a good sign. Are you a member of any organizations that relate to employment law? Lawyers can join organizations that focus on specific practice areas. These organizations serve to provide legal education and community. In California, we are lucky to have the California Employment Lawyers Association, which has a membership of over 1,000 plaintiff-side employment lawyers. We also have the State Bar of California’s Labor and Employment Law section, which serves employment lawyers — plaintiff and defense — throughout the state. In Los Angeles, we have the Los Angeles County Bar Association, which has a very active Labor and Employment Law Section that puts on wonderful programs. Other such organizations exist. Have you taken on any leadership roles in any employment organization? Joining an organization is one thing (for some, all one needs to do is mail in a check to join), but it is another to be actively involved in organizations and give generously of one’s time. Leadership roles are a sign that the lawyer is committed to the practice area, seeks to contribute to the community, and is respected by their peers. Other questions to determine a lawyer’s reputation in the legal community. Although you can’t necessarily ask it directly, try to see if there are other ways you can find out about a lawyer’s reputation in the community. Do they contribute to the community as a whole? Are they respected by lawyers on the same side of the bar? Do they work well with their opposing counsel? The ideal attorney is one who is a tenacious advocate for their client while being courteous, cooperative, and professional. The type of lawyer who is a right fit for you very much depends on your own personality. Do you want someone who is empathetic and compassionate to hold your hand through the litigation process? Would you rather someone more curt who cuts to the chase? Remember that chances are you are not paying by the hour. Do you favor emails over phone calls or vice versa? Hopefully, you will find someone who has been vouched for, whether by someone you know or by an online authority you trust, and who feels right to you. For more information on how to prepare for your meeting with the attorney, read this post. Note that, unlike many other states, California allows lawyers to give each other referral fees and they are fairly common practice. In fact, in some practice areas such as personal injury law, they are the norm and expected. A lawyer’s taking/giving a referral fee should not deter you but, once again, you must confirm that the recommended lawyer is right for you.